Cut: Four to five inches beyond the collarbone with the front angle starting just above the chin. Long, progressive layers ensure that fine hair is not over-layered. Why it works: A multi-directional part helps create extra height that works with a heart-shaped face. The long fringe cascades across the jaw line and brings attention to Kelly’s best features. To style: For fine hair, use David Groshen Gel Mousse. For medium hair, use David’s “Secret Fried Egg Formula.” For coarse hair, use David Groshen Orange Stuff. Do this while hair is soaking wet and make sure to distribute the product evenly throughout the hair. Preset the direction of the part to use as a guide for your sections. Start the part slightly off-center. Move away from the center towards the ear for an inch and a half, and then back towards the center of the crown to create natural height. For the back and bottom of the hair, use a medium round boar bristle brush. Bend hair in the middle and wrap the ends around the brush. Dry each section completely and let the hair cool while still on the brush. On the top and front sections of the hair, use a large round boar bristle brush. Blow-dry each section on top up and out from the roots at 90°. Bend hair in the middle and pull the brush straight through each section to create straight ends with a soft bend. Separate with David Groshen Hair Polish. Color: Golden red-brown with soft copper-red highlights. Cut: Shoulder-length with the front angle starting at the collarbone. Long layers through the very bottom maintain a blunt line. Why it works: Her natural waves cascade across her cheekbones framing her eyes and highlighting her smile. To style: This is a great natural style for those blessed with wavy hair. Use David Groshen Orange Stuff on soaking wet hair. Distribute evenly. Section the part off-center, back towards the middle of the head. Direct the hair up and away from your forehead until you like the flow of the first wave. Use David Groshen Finishing Spray lightly over your wet hair, and do not touch. Your style is done. Allow to dry completely and enjoy frizz free waves. This is called the Ketty Losetto method of drying hair (named for one of my hairdressers who discovered it). Color: Medium golden-brown with caramel highlights. Cut: Mid-back length with the front angle starting at the chin, and long, progressive layers releasing movement through the bottom of the style. Why it works: The slightly off-center part creates openness at the forehead allowing the swooping side waves to cascade across her cheekbones, enhancing her beautiful eyes and dimples. To style: For fine to normal hair, while hair is wet, use David’s “Secret Fried Egg Formula.” For coarse wavy hair, just use David Groshen Orange Stuff. Blow-dry hair creating soft, long waves with a medium to large round boar bristle brush. Make sure to create the root direction at the part up and away from the forehead. Take a 2-inch curling iron in 2-inch square sections. Starting at the middle of the hair strand, twist once grabbing the ends until all the hair and ends are wrapped around the curling iron. Separate waves with David Groshen Hair Polish and finish with David Groshen Finishing Spray. Color: Blonde on blonde reflects and absorbs light while separate layers enhance her flattering hair shape. Cut: Mid-back length with long, progressive layers and an angle starting just below her chin. Why it works: The key to a heart shape is to lift and open the center of the forehead to create height. 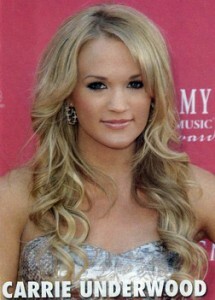 Carrie’s style conjures an illusion of length on her face. The style flows which compliments her beautiful, high cheekbones. To style: To achieve this style use David’s “Secret Fried Egg Formula.” Create a diagonal part to create natural height and then blow-dry the hair, paying attention to the root direction. You can either use hot rollers or a 1 ½ inch hot iron to create the beautiful curls and waves. Separate and smooth each section of waves with the smallest amount of Hair Polish. Cut: Mid-back with the front angle starting at the chin and long progressive layers. Why it works: The center part brings an openness through Kate’s somewhat high forehead that creates a unique way to lengthen and narrow a square face. The first wave flows right off the cheekbone, enhancing her beautiful bone structure. To style: For fine to medium hair, use David’s “Secret Fried Egg Formula.” For medium to coarse hair, use Orange Stuff. Create a center part and separate hair into four sections. Use a very large round boar bristle brush and pull hair as straight as possible while drying. Pass your largest round iron through the ends of your hair, back and away, to create a slight bend and not a complete wave. Use David Groshen Hair Polish to smooth the ends and Hair Wax to separate the waves and add more texture. Color: Dark golden-brown with light golden-brown highlights. Cut: Mid-back with an angle starting below the collarbone and very subtle long layers. Why it works: The wave created by using a side part flows across her cheekbones and into the remainder of the waves for an “old meets new” style. To style: For fine hair use David Groshen Gel Mousse. For medium hair, use David’s “Secret Fried Egg Formula.” For coarse hair, use David Groshen Orange Stuff.Do this while hair is soaking wet and make sure to distribute the product evenly throughout. Separate the hair with a multi-directional center part, outward and back towards the center. Smooth and comb the hair tightly against your scalp, creating a long flowing first wave on the heavy side of the part. Secure the lighter side behind the ear with a hair pin or clip if you have one. If you have the time, allow your hair to dry naturally. If not, secure both sides with a hair pin and blow-dry with the flow of the hair. Be careful not to disturb the part. Use a large curling iron on the unsecured remaining part of the hair. Do not disturb the first wave or the tightness you have created. Use David Groshen Hair Polish to release and smooth the waves. Color: Blonde on blonde with pale blonde highlights in the front crown area. Cut: The front angles start below the chin; long progressive layers. Why it works: The openness at the forehead and an off-center part create a wave that drapes beautifully across Ali’s cheekbones, accentuating her bone structure and her smile. Preset the style by creating a side part while the hair is wet. Blow-dry the hair with a medium boar bristle brush to create lift at the crown and sides. Set hair on the brush at a 90° angle and cool completely on the brush for each section. Take a 1 ½ inch curling iron with one-by-one sections of hair through the temple downward. Make sure the front wave flows into the smaller waves you created through the iron. Finish with David Groshen Hair Polish to separate and smooth the luscious waves. Set the style with David Groshen Finishing Spray— a fine mist for subtle hold. Color: Medium to light chocolate-brown with copper-blonde highlights. Cut: Mid-back with a front angle starting at the collarbone and long, progressive layers that release natural waves. Why it works: The off-center part creates openness at the forehead allowing the first wave to drape just above the cheekbones, enhancing her jaw line and eyes. To style: For wavy hair, use David Groshen Orange Stuff. Then part the hair when it’s wet in the center to create the direction and placement of the first wave. When the hair is very wet, use the slightest amount of Finishing Spray to seal in the shape of the waves. Do this without touching hair until it has dried. If you’re not blessed with naturally wavy hair, set the wave pattern as above and blow-dry, then curl with a large 2-inch round iron. Separate with Hair Polish and don’t be afraid to really shake your hair free to create natural looking waves.